Create an unlimited number of publications without paying royalties. Flip templates are 100% customizable, making them a smart solution for digital publishing. 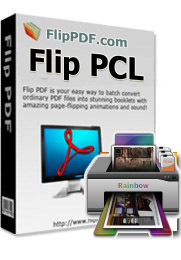 Flip PCL is a professional e-publishing software that allows you to create your own interactive E-flash flip book from PCL (standard print format for HP LaserJet-compatible printers) with a few mouse clicks. With its easy to use interface, you can make a digital publication in a few mouse clicks! Even a new user, you can use Flip PCL within a couple of minutes without any special learning. With Flip PCL , you don't need any flash skills, only import your PCL files (*.pcl) , and then choose the theme (look&feel) templates from a variety of pre-set settings from Flip PCL, finally to build your attractive flip book with the real page turning effect. At a Glance: Easy! Even a new user, you can use Flip PCL within a couple of minutes without any special learning. Printer Command Language, more commonly referred to as PCL, is a page description language (PDL) developed by Hewlett-Packard as a printer protocol and has become a de facto industry standard. Originally developed for early inkjet printers in 1984, PCL has been released in varying levels for thermal, matrix printer, and page printers. HP-GL and PJL are supported by later versions of PCL. PCL is occasionally and incorrectly said to be an abbreviation for Printer Control Language which actually is another term for Page description language. With our easy to use interface, you can make a digital publication in a few mouse clicks! 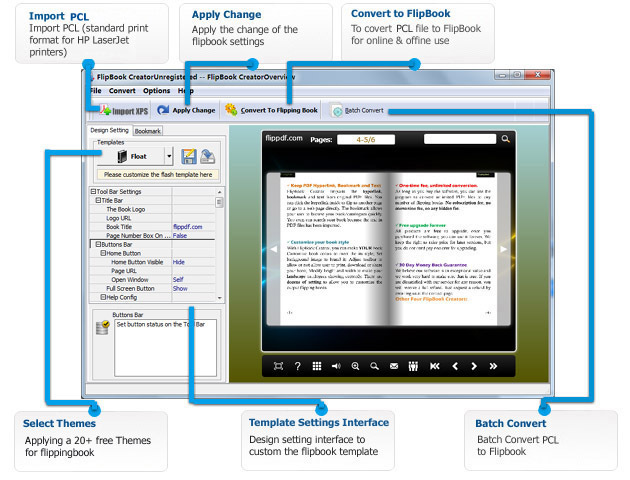 Even a new user, you can use Flip PCL within a couple of minutes without any special learning. Just import your Printer Command Language files (*.pcl) document, select the flipbook themes, and then click the publish buttom! Beside Flash version, all publications created by Flip PCL will also include HTML5 version. The readers will be able to open your flip page publication in any environment (PC, Mac, iPhone, iPad, Android, or Windows Mobile), and you can even publish at your Facebook page. If you have a Google Analytics account, you can make use of Flip PCL’s built-in functionality Google Analytics Embedding. The code of Google Analytics can be embedded to each book and all statistics will be available from your Google Analytics account live. Create, design, control and increase your marketing effectiveness using Google Analytics within the publications. Once you have purchased the software, you can use the program to convert an unlimited number of PCL files (*.pcl) to any number of page-flipping eBooks. No subscription fee, no conversion fee, not limited to a single website.